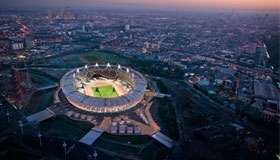 The Met Office is providing weather forecasts for all Olympic venues during the Games and beyond. As part of the services provided for London 2012, we have installed additional weather observation equipment and developed enhanced forecasting capability to support our staff. During the Olympic and Paralympic games the Met Office will also be showcasing some cutting-edge weather techniques and technology in its forecasting, as well as providing additional services for the public. To add specialist knowledge and expertise, the Met Office will have 12 forecasters on site across the Olympic venues throughout the games. For easy access to the latest forecast for each sport and Olympic venue, all the links you need are below. If you’re lucky enough to be attending an Olympic or Paralympic event, you can keep up to date with the local forecast while you’re there on our mobile applications for iPhone and Android, or on our mobile website. This entry was posted in Met Office News and tagged 2012, forecast, London, Met Office, olympic, Olympic Games, weather forecasting. Bookmark the permalink.